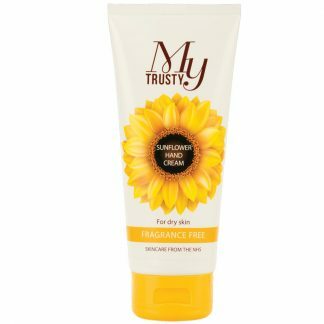 NHS Skincare, My Trusty, Sunflower Body Lotion, Fragrance Free (250 ml) is a gentle moisturiser to keep your body soft and supple for up to 24hrs. Rich in essential skin improving vitamins E, F and K, this is the ideal skincare to soothe and nourish, dry sensitive skin. ‘Freefrom’ lanolin, parabens & SLS. Blended with naturally active sunflower oil, this unique formula has been clinically proven to help improve the appearance of blemished skin, i.e. scar tissue or stretch marks. Suitable for people who may be prone to eczema and other similar dry itchy skin symptoms. Dermatologically tested & paediatrician approved. Suitable for people of all ages. I first purchased My Trusty Sunflower products after having two skin grafts on my face. As I had to moisturise the grafts regularly I tried the scent free NHS skincare products and loved it from the start. It goes on smoothly and isn’t ‘sticky’. All the family use the Sunflower cream. I still use the whole range and would recommend My Trusty sunflower cream to anybody whether they have a skin condition or not. 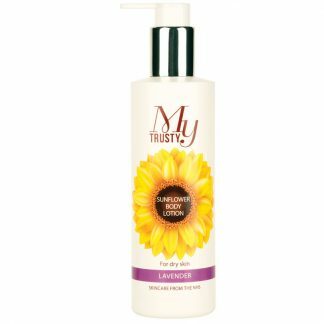 I love My Trusty’s Sunflower Body Lotion. It isn’t at all greasy yet it is easily absorbed and still hydrates my dry skin. Thank you very much for the NHS body lotion! My Mum and I love it! It absorbs quickly and the skin feels soft to touch instantly after use.It also doesn’t feel oily or greasy to use, something others often do. I would highly recommend this lotion and will certainly be interested in purchasing it and other NHS products in the future! I’ve suffered with dry and itchy skin for a number of years. It got to the point that I began to avoid sport as getting hot and sweaty made it worse. After being recommended My Trusty from a friend I bought some and I can honestly say it’s changed my life! I’m back to enjoying sport and love the fact I don’t keep scratching!!! it is a fantastic cream, I was using E45 but stopped when I received my product and have not gone back and lastly it is wonderful to hear that profits go back into the N.H.S.. I really do like the new look it is very eye catching and goes extremely well with what it is all about, also glad to hear it is now available in the said shops. Having used these products myself for daily skin care and for my grandchildren with good results, I decided to use them for my bed bound husband. We are so pleased with his skin condition and total lack of any sores that our GP and palliative care team are now recommending them to patients and carers. I cannot think of another simple, trusted group of products that give such great results for the whole family. I regularly recommend My Trusty. It’s been great for my skin during chemo and radiotherapy. Thank goodness for My Trusty! I have used this product since it came out, I occasionally try other creams but my face doesn’t feel comfortable – I have always come back to my trusty. It is easy to apply, has a pleasant scent, and it last most of the ‘working’ day, but most importantly it WORKS by relieving and healing. A lovely cream for all ages and skin types, wouldn’t be without it. Just put me down as one very satisfied customers on all fronts. The cream works wonders and benefits patients into the bargain, what more can you want?! An absolutely amazing product. It cleared up the eczema completely and no steroids needed. My son, now aged 26, was a patient in Odstock burns unit in 1991. He had a scalding accident. This cream was prescribed and was invaluable. I was thrilled when my sister bought me a gift pack for Christmas! I then bought a set for my sons pregnant wife. An excellent product. I would recommend the cream, I have suffered from Roscea for years and it got worse during the winter. I purchased some My Trust Sunflower cream and the redness calmed down. My husband has psoriasis, and after all these years, has finally found a moisturiser that actually keeps his affected areas soft and itch free for longer that any other product he has used. Use the 100ml, and now onto the 250ml pump. Better value for money. My husband and I went on holiday recently and we both got sunburned. He used a proprietary after sun cream, and I used My Trusty cream. Guess who didn’t peel? Me of course. It’s wonderful and I shall certainly be recommending to everyone I know. Thank you. I think the cream is wonderful and recommend to people all the time, as well as buying it as a present. 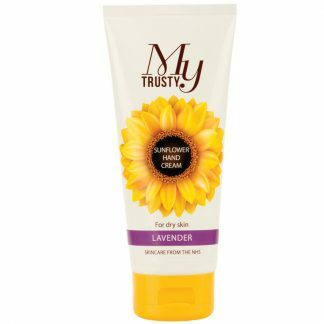 I suffer from itchy legs at night, and the sunflower cream instantly soothes them. Has eczema and allergic to everything skin. Has signed using the cream, effects are great legs never looked better and eczema scarring from childhood now seems to be reducing.